It has been a super busy week at the Westway with plenty of new routes being set and competitions being planned. You guys have been busy too, with lots of intense training and tea drinking going on in the wall. The new routes on our fresh featured wall have been taking a pounding with loads of you perfecting that foot work by using only features for feet. Add a plus to that grade you people. Check this guy out with that cross arm clipping. Such a cool new wall. It has been getting chilly in the wall which can only mean one thing. Competition time is on its way. On the 3rd of November The London University Bouldering Event comes to the Westway. This multi round bouldering comp affectionately named LUBE will be holding its first round on our front bouldering wall, or to those in the know, the Oven. We will be setting some killer problems to try shut down the best student climbers in the land. So be sure to come down and try and send a few yourseves. If you’re a student and want to take part, click on the link below. We are also busy organising this season’s Super League. Last year was a massive success with climbers of all abilities throwing down on, undoubtedly the sickest comp problems ever set at the Westway. The atmosphere was great and we are so excited to be putting it on again. So excited in fact, we are making it even bigger, better and way more super. This season’s Super League will be four rounds instead of three and will have some amazing prizes, as well as the usual tasty doughnuts. You guys had better get training, I saw this one guy last night doing one arm pull ups on the Beastmaker. But don’t freak out just yet, there is still plenty of time. The Super League has been moved and the first round will now start on 15th January 2013. Over the pond Team Westway are continuing to climb the famous climbs of the Yosemite Valley. Andre has been tussling with the mega steep crack line, Separate Reality. Check out the pictures for tickets to the gun show. After their characteristic epic on Royal Arches, Shan and San had retired to Lake Tahoe for some five star routes, mountain biking jet ski debauchery and general beach action. This ‘chilling out’ had to end though, as Liam Halsey, the Walkers Crisp speed lead champion had arrived in the valley and had warmed up by soloing Royal Arches, fresh from the plane, POW! With the team assembled and ready for action it was time for something big..... only for disaster to strike straight out the blocks. While leaving a car Shan closed the door behind her but left her thumb behind. This could have spelled an end for her climbing adventures for this trip. Being a hardened South African, drastic measures were considered but full amputation was ruled out. Instead she popped a couple of Nurofen, taped up and went jamming. The group of Westway’s finest made a team ascent of the Rostrum. The Rostrum is considered to be the best climb in the Valley. Although saying that any climb in the valley is ‘the best’ climb will be met by many other alternative suggestions. Nevertheless the Rostrum is an amazing 8 pitch crack system that offers consistently fantastic hand and finger jamming action. The route is 240 meters long and takes most parties around 7 hours to ascend. Seeing these pics makes me angry, I just want to be climbing crack too! I guess in the mean time I will just have to keep training. There are lots of cool routes up in the wall at the moment to keep us fit until we jump on that plane to the states. Back in the wall more excitement this week came in the form of a royal visit. Her Royal Highness Princess Beatrice is back from a trip to the Alps where she and a team climbed Mont Blonc to raise funds for the Big Change Charitable Trust. They have been paying the Westway a number of visits to work on those important rope skills before undertaking their big adventure. This week they were in to talk to the BBC for a live broadcast on breakfast news. Follow the link to check out the video. While climbing in the wall lots of people have been asking us about the new quickdraws we have been putting up all over the place. Well, they are the new DMM Alpha Sport Gates and they are the smoothest gates I have ever clipped. You just have to put the rope near the draw and KAPOW the things clipped. DMM claim that it's the most ‘clip friendly’ biner they have ever made. We have had some great feedback from all you guys that have been using them. Compare them to the other biners around the wall next time you're in for a climb. Just don’t take too long because soon we will be going full Alpha gate. They are available at Urban Rock. We are eagerly awaiting the new steel versions that will be longer lasting. You guys and your crazy whippers really wear out our quickdraws. Now get on that Beastmaker and try those one arm pull ups. The Super League is coming! 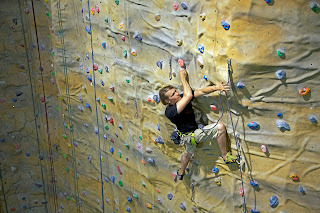 The Westway climbing centre is the premier climbing venue in London and the south east. With over 120 roped lines and 150 square meters of bouldering there is something for every level of climber.